How the adjective unknown became a crucial contributor to the modern christian doctrine of tongues. No, it was not started by Paul in the first century. The tradition of unknown tongues begins with the Reformation in the sixteenth and evolves from there. This article is the story about how this unfolded. Click on image for a full version. 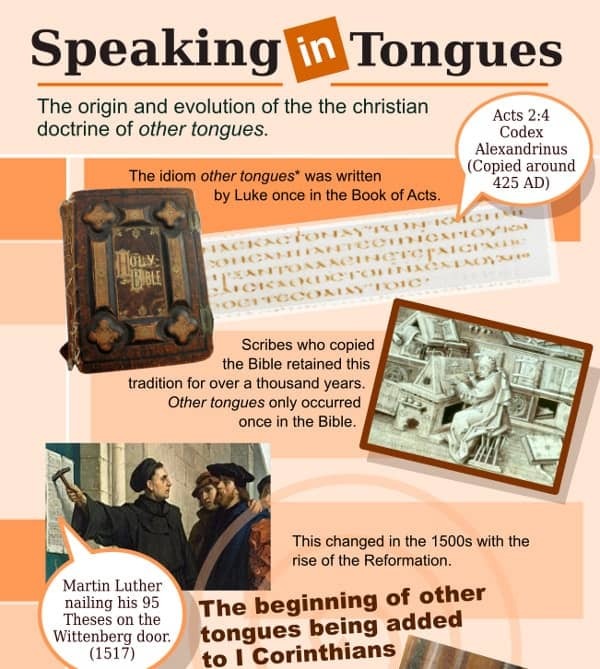 The other tongues of the English Bible has a rich tradition that dates back to the earliest days of the Reformation. The creation of this idiom had powerful political and religious overtones. An idiom the early Protestants created and aimed exclusively at the Catholic Church. The Catholic Church asserted their authority through the exclusive use of Latin while the Protestants volleyed back that Latin was speaking in an unknown tongue that no one understood. Unknown to the word tongues was added in Paul’s famous Corinthian text to win the Reformation argument. As will be shown later on, the addition of the adjective other to tongues by Protestant translators in the I Corinthians texts was to wrest Catholics of their divine authority. This intent got lost over the centuries and became reinterpreted as a mystical or magical expression. The Pentecostals relied heavily on their interpretation of other tongues to justify their tongues-speaking experience. This was especially key after the missionary tongues crisis that happened in early Pentecostalism. Pentecostals originally believed the supernatural outpouring of tongues was for missionary expansion: the Gospel was to go to the ends of the earth before the imminent coming of the Lord. However, the earliest Pentecostal missionaries soon discovered after journeying to foreign lands that they did not have the supernatural ability. The greatest example was that of American Pentecostal missionaries, Alfred and Lillian Garr, who came to India believing they had the miraculous ability to speak Bengali, but upon arrival did not. This problem was so universal throughout the Pentecostal missionary world that the movement was forced to either abandon or redefine the experience. They chose the latter. One of the key texts that allowed a reappraisal was the idiom other tongues as found in the English Bible. Other tongues allowed the idea that speaking in tongues was not supernaturally speaking a foreign language but something otherwise; a heavenly prayer language or the language of divine worship. It was an entity beyond the realm of human intellect and could not be measured. Most charismatic and Pentecostal leaders are unaware of the history of other tongues and its Reformation roots. Rather, they take it literally as written by Paul himself. The late charismatic leader Kenneth Hagin made this a cornerstone for his tongues argument in his book, Seven Reasons Why Every Believer Should Speak in Tongues. He doesn’t qualify it, just assumes that other tongues is a legitimate source text and heavily leans upon it. The idiom had no strength when it was only attached to Acts 2:4, when it was expanded to I Corinthians in 1534, this allowed for new ideas to perpetuate. The Pentecostal usage of other tongues outside of Acts 2:4 disregards the historical background or proper usage of the texts. The following is an investigation into the origins and development of the other tongues doctrine that predated the Pentecostal movement. The motivations that caused the other tongues idiom to be added to the I Corinthians English Bible text had political motivations more so than a theological impetus. This article is based on research that compared six early Bible translations. The actual results can be found by reading, The Unknown Tongues of the English Bible: Part II. One of the most important observations from the research was that the Authorized King James version of the Bible made the translation, unknown tongues in the Book of I Corinthians a universal term. The Wyclif Bible, the earliest known English translation published in 1380, does not contain the adjective at all. It also predominately used the word langagis (languages) instead of tongues in the key-texts. The Tyndale begins adding an adjective first in 1534 but not significantly. The Geneva Bible expands on this pattern in 1557 and the King James Bible entrenched this phrase in 1611. Let’s go behind the English translations a bit further and unpack some background to why this happened. This phrase did not exist in early Christian literature but began to surface in the 13th century and rose to prominence in English Bible translations during the Reformation. Aquinas’ usage is the first documented time that the term unknown tongue is dogmatically used. His text in Latin reads, lingua ignota. This Latin phrase was also used by Hildegard of Bingen in the 12th century regarding a self-made secret language,3 but it is an isolated case not related to Ecclesiastical usage. Lingua ignota is not used in the Latin Bible, but quietly began to develop in the English translations. It was popularized by the English Geneva Bible and subsequently followed by the King James version, which made the concept universal in the English speaking world. Aquinas undoubtedly had influence on later leaders but this correlation has not been concretely made. This preface tried to remedy two serious problems within the Catholic Church at the time. First of all, it was the reading out loud of Scripture in the Latin vernacular, which the majority of worshipers did not understand. Secondly, the King James preface promoted that the Bible was to be available in any language for anyone to read or listen to. This was a powerful argument at the time and had gone viral throughout Christendom. It was also perceived as a threat to the authority of the Church. Dante represents the Catholic mindset throughout the European world. This Latin sentiment would lead to leadership to refuse any encroachment on the Latin language which the Protestants and other groups and individuals pressed for. It wasn’t only an assertion about the primacy of the Latin language but fear that the rise of common languages would lead to ignorance. These languages were perceived as primitive and unable to historically attach themselves to the past with any intellectual acuity, nor move forward with any structure. The use of localized languages over Latin was a backward progression for humanity according to the elites. This uprising eventually led to the Council of Trent which began in 1545 — presided by Pope Paul III. Pope Paul began his leadership of the Catholic Church in 1534, which was the same year the Tyndale version first produced “other tonges shall cease” in I Corinthians 13:8. It demanded a response. The Council of Trent, 4th Session came up with strong language that all publications had to be approved by the Church authorities prior to printing. Special emphasis was on the Latin Bible as being the only authentic one, all the rest are inferior. It failed to address the fact that the majority of the church audience did not understand Latin or how to remedy this problem. Moreover, the same sacred and holy Synod,–considering that no small utility may accrue to the Church of God, if it be made known which out of all the Latin editions, now in circulation, of the sacred books, is to be held as authentic,–ordains and declares, that the said old and vulgate edition, which, by the lengthened usage of so many years, has been approved of in the Church, be, in public lectures, disputations, sermons and expositions, held as authentic; and that no one is to dare, or presume to reject it under any pretext whatever. Furthermore, in order to restrain petulant spirits, It decrees, that no one, relying on his own skill, shall,–in matters of faith, and of morals pertaining to the edification of Christian doctrine, –wresting the sacred Scripture to his own senses, presume to interpret the said sacred Scripture contrary to that sense which holy mother Church,–whose it is to judge of the true sense and interpretation of the holy Scriptures,–hath held and doth hold; [Page 20] or even contrary to the unanimous consent of the Fathers; even though such interpretations were never (intended) to be at any time published. Contraveners shall be made known by their Ordinaries, and be punished with the penalties by law established. One naturally has to look at the German by Luther at this time period to see if there are any similarities of approach. He does not follow the same convention of the English translators about adding the equivalent adjective of unknown in the German language. However, he does meddle with the Corinthian texts on tongues. Heinrich August Meyer noted in his Critical and Exegetical Handbook to the Epistles to the Corinthians, wrote that “Luther too, up to 1528, had “tongues” but from that date onward has “languages.” In chap. xiv., however, he has still “tongues” in 1545.”7 Why did Luther change from tongues to languages and vacillate between the two? It is not known. His influence among the many Protestant leaders who came to Geneva, either through expulsion or for missionary purposes, further reinforced this mindset. An English Bible was produced in Geneva with a Protestant sense, and thus called the Geneva Bible, which was based on the earlier Tyndale Bible. It became a runaway best seller in England. The Geneva Bible greatly reinforced the addition of other tongues in I Corinthians. It set a new tradition that the King James version adopted in its translation. So now it is becoming clear that the idiom unknown tongues became a popular doctrine in 1534 as a dispute against the Catholic Church. It was a strong statement that anything said in Latin, and not the local vernacular was not profitable. The idiom initially no suggestion of a mystical or supernatural sense that Renewalists (Pentecostals, Charismatics, and Third Wavers) attach to it today. How the English Bibles evolved with this adjective, see The Unknown Tongues in the English Bible Part 2. MPL. Vol. 92. Bedæ Venerabilis: Liber Retractionis In Actus Apostolorum. Col. 999. My translation from S. Thomae Opera. Robert Busa, S.I. ed. Fromman-Holzboog. 1980. Reportationes 088 R1C cp 14 Pg. 387 lc1. For more information on Thomas Aquinas on the dogma of tongues see Thomas Aquinas on the Miracle of Tongues Intro. http://history.hanover.edu/texts/trent/ct04.html The Council of Trent .The Fourth Session. Trans. J. Waterworth (London: Dolman, 1848), 17-21.